The oddest-case-scenario came true in the wee hours this morning at Ziv Medical Center, located in northern Israel near the Syrian border: A 20-year-old Syrian woman gave birth to a healthy, 3.2-kilogram baby boy. The woman is one of over 450 Syrians who have been treated in Israel so far this year. But unlike the others, said Ziv Medical Center spokesman Gil Maor, this young patient hadn’t been injured by a bomb or sniper fire. The woman succeeded, and — after being picked up at the border and rushed to Ziv in an IDF ambulance — she gave birth to her firstborn at 3:11 a.m. today. “There were no village midwives who could help me deliver. 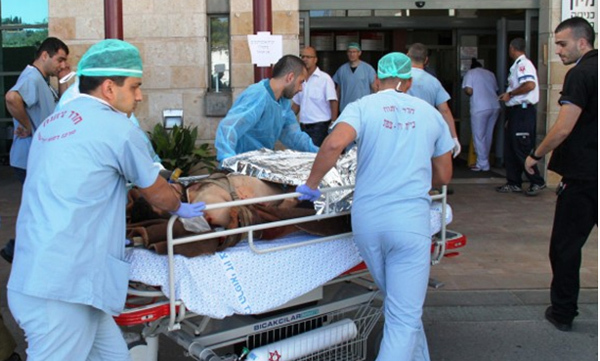 I am a nurse by profession, and I knew that Syrians were treated in Israel. … So when I felt that labor had begun, I quickly brought myself near the border, in hopes that the Israeli army would allow me to get medical assistance. Fortunately, the Israeli army saw that I was suffering from severe pain, picked me up and took me to a hospital in Israel. I was afraid to come to Israel, but I was more worried to lose my baby during a home birth. The obstetric team and Israeli doctors treated me with respect and sensitivity and the birth was uneventful. I really do not feel like I’m in an enemy country; everyone is helping me and cares about me. The question at the back of everybody’s mind: Will the child be considered an Israeli citizen? The issue did come up in an interview for my L.A. Jewish Journal cover story this week, “Wounded Syrians find care in Israel that is no longer available at home.” Sara Paperin, international liaison at the Western Galilee Medical Center (a hospital in nearby Nahariya that is also treating Syrians), said one pregnant woman who was about to pop decided to leave the hospital before her older daughter had been discharged, specifically to avoid finding out what would happen if her baby was born in Israel. If the mother and child continue in good health, they will be discharged within the next two to three days, said Maor — at which point the IDF will come pick them up and take them back to Syria. When the IDF detects one or more war casualties approaching the new high-tech fence Israel built this year to keep out the flying parts of Syria’s civil war, “We open little passageways so they can come through,” the soldier said. Once the wounded are inside Israel, a temporary medical station is set up at the site of entry, and a handful of IDF doctors rush out to operate. From there, depending on the severity of the patients’ wounds, they are either released back to Syria, transferred to the IDF field hospital or transported via IDF ambulance to one of three medical centers in Israel providing more long-term care. 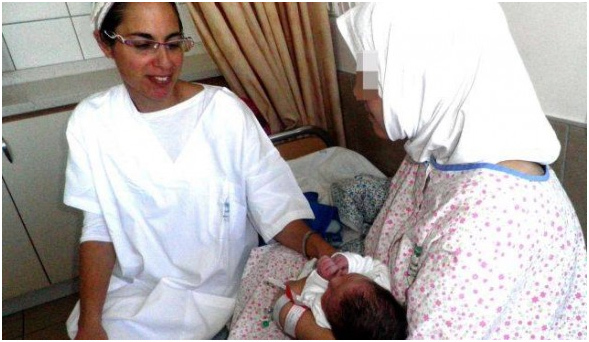 Update: Here’s a photo of Israel’s newest Syrian patient, taken by Hannah Bikel.